The Voragine Crater on Etna hasn’t seen activity in two years according to the National Institute of Geophysics and Volcanology (INGV), a research institute in Italy, but last night the crater saw its first paroxysm. A lava fountain reaching 1 kilometer above the volcano along with a 3 kilometer ash bloom lasted all of 50 minutes. 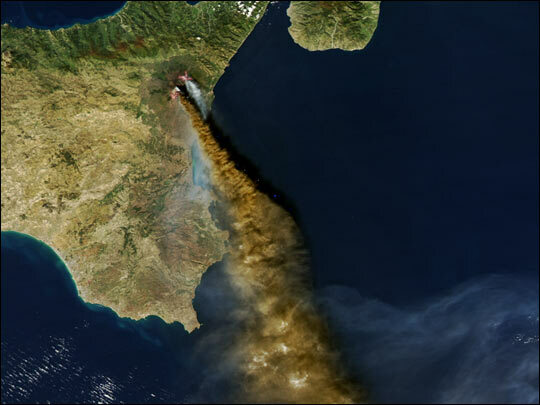 This was Etna’s first momentous eruption since May when Strombolian activity inside Etna’s New Southeast Crater (NSEC) occurred. Etna has been oozing lava now and again throughout the year, but this eruption has produced an incredible display of lava, lightning and ash. A few photos posted around the world of the event.